INDUSTRY ONE HOLSTER AT A TIME. Through time-honored tradition, the fourth-generation leather artisans at 1791 Gunleather have cultivated a unique understanding of what the responsible firearm owner needs in their collection of leather gun holsters. Our diverse selection of styles suit individual carrying preferences, striking the perfect balance between concealment and accessibility, function and comfort, durability and price. Ever since we entered the marketplace, we have continued to rapidly take over market-share from big players in the industry due to our superior quality and competitive pricing. While shopping around for gun holsters, you’ve probably noticed you can buy cheap neoprene sleeves with plastic belt clips that cost as little as $20, or you can buy embellished, exotic skins setting you back hundreds or even thousands of dollars. The 1791 Gunleather gun holsters fall between these two extremes, with competitive, affordable pricing to fit within your budget. The value of our holsters is in our materials and craftmanship. We don’t charge extra for brand reputation. We get the job done with durable, handcrafted 100% Certified American Heavy Native Steerhide leather that custom-molds to your body for supreme comfort and fit. Our lifetime warranty is a testament to how confident we are in our abilities to create a product that withstands the test of time, and to how willing we are to stand behind our valued customers. Your choice of style in Stealth Black, Brown on Black, Signature Brown, or Classic Brown. 1791 Gunleather is proud to offer a full inventory of open top holsters as well as models with thumb break features. An open top gun holster holds your weapon in place securely for ease of access and quick draw. Open top holsters are particularly common in law enforcement, although some officers prefer an added safety measure to prevent perps from attempting to remove weapons. Our models with thumb-break snaps are perfect for anyone who is worried about another getting their hands on your gun. It’s all a matter of personal preference and type of use. Our open top gun holsters are customized to fit a number of different carries, including 1911s, Beretta, Browning, Colt, FN, FNX, H&K, Kimber, Ruger, Sig Sauer, Smith & Wesson, Springfield, and others. We have specific models designed to hold Glock 42s and Glock 43s with the same glove-like fit characteristic of all our products. Three or four-way positioning allows for a quick reaction, whether you prefer to pull vertical, horizontal, cross-body, or cross-body inside the waistband with a conceal carry clip. We offer right-handed, left-handed, and ambidextrous designs. The belt-slide feature found in some models prevents the firearm from pressing against the seatbelt buckle when entering and exiting vehicles. Revolver holsters can be a little bit tricky to purchase as they must match your particular firearm. Each model tends to boast its own virtues and have its own devoted followers. For example, our J-Frame sized revolver OWB belt holsters are a favorite among motorcycle riders carrying snub-nose Smith & Wessons or Ruger LCRs. K-frame sized OWB revolver holsters accommodate barrels from three to six inches in length, from Smith & Wesson M&P Bodyguards to Ruger Vaqueros or S&W 686s. Search our inventory to find the right fit for your revolver. The belt holster is the most common type of holster out there. While you can find some old-fashioned chest slings and ankle holsters, the classic belt holster lets you carry your self-defense weapon of choice close at hand, in the most natural position. When shopping for the right belt holster, you’ll want to consider the cant of the holster – how tilted forward from vertical you want your gun to ride. Can’t ranges from 0 degrees with a straight-drop vertical holster, to 10-20 degrees with an FBI cant holster, to comfortable, easy-draw 30-degree cants. Buyers should also consider whether a cross-draw capable holster is a feature you desire. Some people feel cross-draws offer the best accessibility from a seated position and comfort. It’s easy to surreptitiously draw your weapon and less likely for someone to grab your firearm from behind. If you’re shopping for a holster to use out hiking and hunting, cross-draw capability may not be of much use to you. Also, in close combat situations, it can be difficult to cross-draw your weapon, particularly without overshooting your target or injuring bystanders. Depending on the model, some 1791 Gunleather holsters accommodate up to three possible positions, with Vertical, Horizontal, and Cross-Draw cants in ambidextrous style. When you require maximum flexibility, choose a holster that offers both IWB / OWB carry positions for inside or outside the waistband. The most common choice you’ll face in concealment holsters is whether to carry Inside the Waistband (IWB) or Outside the Waistband (OWB). IWB holsters typically offer more concealment than belt holsters, allowing you to safely tuck your carry inside your pants and beneath your shirt. They may be worn at the one, three, or six o’clock positions. They connect to your belt using J-hooks, clips, and loops, keeping your weapon closer to your body and inaccessible to perpetrators. The downside is that you’ll need to buy your pants a little bit larger to accommodate the width of your gun – and even then, you may find this type of holster uncomfortable for a full day of wear. IWBs are trickier to pull from and to re-holster, so they are better suited for extremely confident carriers who can make up for the loss of speed and efficiency. OWB holsters are much more visible, thought they are generally not a problem if you live in an area where open carry is legal and accepted. People like OWB holsters, as they have a confident, firm grip on the trigger. OWBs are often worn on the wearer’s dominant side with a slightly forward FBI cant at the three o’clock, all the way up to six o’clock, position. This forward-cant is perfect for concealing the bulge of a weapon grip beneath a shirt or jacket. Cross-draw OWB holsters allow a nine or 11 o’clock position for people who spend most of their time seated. Why are leather holsters superior? 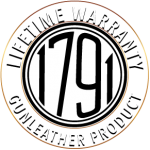 All 1971 Gunleather holsters are all made from the highest quality of Certified American steerhide leather. Leather is a traditional material for American holsters, with an incredibly long and rich history dating back to the mid-1800s days of Wild West frontiersmen. Compared to molded thermoplastic holsters, a leather holster will not warp sitting on a car dash on a hot day. It won’t shatter or crack across a point of weakness as it ages. Leather holsters are unrivaled in their comfort. A 1791 Gunleather holster will break-in and stretch slightly, conforming to the contours of your body and becoming more comfortable with wear. The beauty of our handcrafted pieces of leather cannot be overstated. They are a statement piece you’ll cherish and want to pass down for generations. Contact us for custom assistance shopping for your perfect leather holster. Part of being a responsible exerciser of Second Amendment rights is properly securing your firearm. Every citizen deserves to proudly carry in comfort all day long. Making the right choice in gun holster will assure you can have it both ways. As a small company, we take great pride in providing valued customers with friendly, personalized service. Contact us to discuss your preferences and find the gun holster that best suits your uses. If, for any reason, the holster isn’t how you imagined, you can return the holster at no additional charge for an exchange or full refund.